A lot of people regard Cubans—who have mechanical ingenuity bred from decades in a closed economic system—as the best wrenchers on earth. I think that title belongs to the mechanics of Hong Kong, because they do their wrenching on the streets. 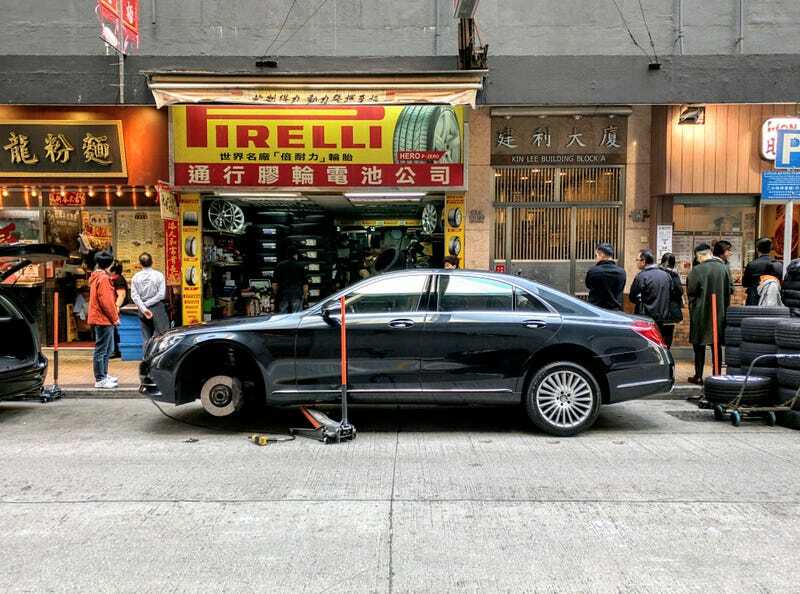 The rent in Hong Kong is too damn high; so high, in fact, that many mechanics use their tiny workshops for tool and parts storage, while the real wrenching gets done on the sidewalks and roadsides. If that sounds dangerous, it’s because it is—and not just for the mechanics who have to worry about being hit by cars, but also for pedestrians, who have to watch out for random engine blocks in the middle of the walkway. Of course, as I showed with that Nissan GT-R shop in Sha Tin, not all mechanics do their wrenching on the streets. But even the big shops in Hong Kong only have space for a few cars. I continually found myself amazed by the conditions in which Hong Kong mechanics have to work. Hundreds of cars whiz by as these folks lie on their backs, turning a wrench to change a clutch or remove a broken CV-axle. And yet, these wrenchers don’t even bat an eyelash; it doesn’t get any more badass than that. A Mustang in a small Hong Kong shop. A tire-mounting shop with some turtles out front. Photo: Michael TracyMechanics doing some sort of fluid replacement on a Toyota Crown taxi. Even the bigger mechanics shops in Hong Kong can only store a few vehicles. Some parts on the curb, just outside of a shop.